Do you have a friendship you’re not sure why you have, that guy or girl that was cool, for a while, until they weren’t? I bet you’re nodding your head, thinking of someone in particular. You are friends with them though, either because you’d feel bad if you dropped them or every time you’re about to they do something that makes you postpone just a little bit longer. You’re stuck with them, admit it. I have a friend, a little old lady possessed of near religious stubbornness. (And an equally zealous distaste for any fuss with computers, so she will never know it.) She’s sweet as pie but with a really, really bad case of S.O.L.S., Stubborn Old Lady Syndrome. It’s an epidemic in Japan. I’m being mean to an old lady? She once told me, an American, how Osama bin Laden was a hero. She then insinuated that I was selfish for not agreeing with her. She is somewhat batty though, and had just given me a very expensive thank you gift for helping her read Great Expectations in English, so I let that rather severe indiscretion go. You see? Stuck with them. She has two hobbies, reading classic English literature and making her own wine. I was over at her home to help with the former when she offered to show me her winery on the second floor. Up we went, where bottles of homemade wine sat in cardboard boxes with upside-down plastic cups as lids. The cups, I noticed, were crusted with dried grape peels and dead vinegar flies. The rims of the bottles shared the affliction. If you happen to know anything about making homemade wine, you’ll know she was missing a few crucial elements. She lifted a bottle. There were things inside that were not wine. She flipped the very same plastic cup serving as the lid over and poured in her bug wine. Then she offered it to me. “Um…there are bugs inside,” I said, watching them swim around in circles. She made a dismissive sound in her throat like she does, berating me for not appreciating extra protein. “Okay. Here.” She swiped the cup away and drank it herself, bugs and all, then refilled it and returned it to my hands. In Japan, I generally take a “when in Rome” philosophy. This, however, was not one of those times. But seeing how I was not getting out of this without hurting her feelings, I did the next best thing. I pursed my lips together and tilted the cup back so it looked like I drank some. She pops on a cork she had stored in a nearby box, then wraps it with tape so it doesn’t leak. Both wines are then wrapped in a handkerchief with the knot at the top so I can carry them. 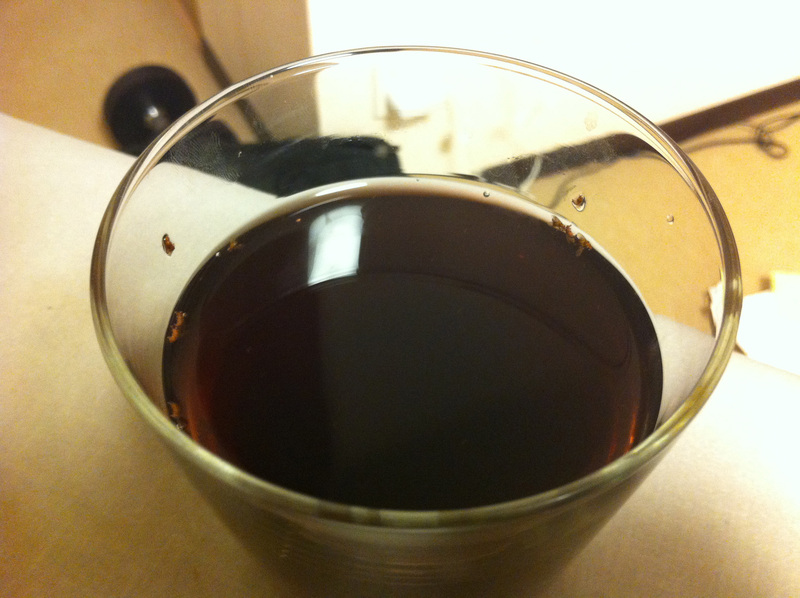 At home, I pour a cup from the first bottle and watch the vinegar flies swim laps around the rim. Then I drain it, and the rest in my sink. After it’s all gone there’s still some kind of purple-grey sludge at the bottom that won’t come out, and I need glass bottles clean or the garbage man won’t take them. So for the next fifteen minutes I have to shake water around inside and make my apartment reek of vinegar until it all drains. My air filter is going ballistic, flashing warning lights telling me there are contaminants in the air. I know, air filter. I know. Question of the Day: Do you know any ridiculously stubborn people? And yeah, we’ve just started Heart of Darkness. She seems to be enjoying it. How’s things?